TrustVeterans.com - A Veteran's Take: 10 Reflections of a Warrior. The writing below does not belong to me. I cannot take any credit for its content. I can say however, that it is an enlightening reflection on how numerous veterans may feel in today's time of war. The piece below hits home for me. And I am a transitioned, business professional, out in the civilian market, working my behind off to do what is right for the veteran community. But the demons lurk and tug at heartstrings. They are still woven in the framework of my mind, body and soul. Training, good training, does not just go away because we take our uniforms off and return home to put on a suit and tie. Sometimes, the training becomes our instinct, and in those moments, we are truly vulnerable. 1. He is addicted to war, although he loves you. War is horrible, but there is nothing like a life-and-death fight to make you feel truly alive. The adrenaline rush is tremendous, and can never be replaced. Succeeding in combat defines a warrior, places him in a brotherhood where he is always welcome and understood. The civilian world has its adrenaline junkies as well; just ask any retired firefighter, police officer, or emergency room staff if they miss it. 2. Living for you is harder. It would be easy for him to die for you because he loves you. Living for you, which is what you actually want, is harder for him. It is even harder for him if you are smart and do not need him to rescue you, since rescuing is something he does really well. If you are very competent at many things, he may at times question if you need him at all. He may not see that you stay with him as a conscious choice. 3. "The training kicks in" means something very different to him. It is direct battle doctrine that when ambushed by a superior force, the correct response is "Apply maximum firepower and break contact." A warrior has to be able to respond to threat with minimal time pondering choices. While this is life-saving in combat, it is not helpful in the much slower-paced civilian world. A better rule in the civilian world would be to give a reaction proportionate to the provocation. Small provocation, small response (but this could get you killed on the battlefield). When the training becomes second nature, a warrior might take any adrenaline rush as a cue to "apply maximum firepower." This can become particularly unfortunate if someone starts to cry. Tears are unbearable to him; they create explosive emotions in him that can be difficult for him to control. Unfortunately, that can lead to a warrior responding to strong waves of guilt by applying more"maximum firepower" on friends, family, or unfortunate strangers. 4. He is afraid to get attached to anyone because he has learned that the people you love get killed, and he cannot face that pain again. He may make an exception for his children (because they cannot divorce him), but that will be instinctual and he will probably not be able to explain his actions. 5. He knows the military exists for a reason. The sad fact is that a military exists ultimately to kill people and break things. This was true of our beloved "Greatest Generation" warriors of WWII, and it remains true to this day. Technically, your warrior may well be a killer, as are his friends. He may have a hard time seeing that this does not make him a murderer. Although they may look similar at first glance, he is a sheepdog protecting the herd, not a wolf trying to destroy it. The emotional side of killing in combat is complex. He may not know how to feel about what he's seen or done, and he may not expect his feelings to change over time. 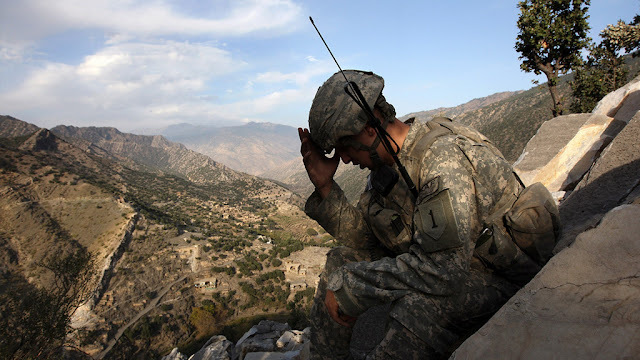 Warriors can experience moments of profound guilt, shame, and self-hatred. He may have experienced a momentary elation at "scoring one for the good guys," then been horrified that he celebrated killing a human being. He may view himself as a monster for having those emotions, or for having gotten used to killing because it happened often. I can personally recommend 'On Killing' by Dave Grossman. 6. He's had to cultivate explosive anger in order to survive in combat. 7. He may have been only nineteen when he first had to make a life and death decision for someone else. What kind of skills does a nineteen-year-old have to deal with that kind of responsibility? One of my veterans put it this way: "You want to know what frightening is? It's a nineteen-year-old boy who's had a sip of that power over life and death that war gives you. It's a boy who, despite all the things he's been taught, knows that he likes it. It's a nineteen-year-old who's just lost a friend, and is angry and scared, and determined that some *%#& is gonna pay. To this day, the thought of that boy can wake me from a sound sleep and leave me staring at the ceiling." 8. He may believe that he's the only one who feels this way; eventually he may realize that at least other combat vets understand. On some level, he doesn't want you to understand, because that would mean you had shared his most horrible experience, and he wants someone to remain innocent. 9. He doesn't understand that you have a mama bear inside of you, that probably any of us could kill in defense of someone if we needed to. Imagine your reaction if someone pointed a weapon at your child. Would it change your reaction if a child pointed a weapon at your child? 10. When you don't understand, he needs you to give him the benefit of the doubt. He needs you also to realize that his issues really aren't about you, although you may step in them sometimes. Truly, the last thing he wants is for you to become a casualty of his war.